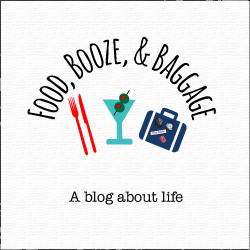 I’ve been spending a lot of time on the blog. Seriously people, I had no idea how much time blogging was going to take up. I often wonder if it takes me an unreasonable amount of time to put posts together. Last weekend we went to Charleston for a long weekend with some friends…don’t worry there will be a post on that 🙂 Because I knew I would be unable to work on the blog, I spent the majority of my previous Saturday putting together posts. On that Saturday, while I sat on the couch, P went grocery shopping, did errands, and cooked dinner without complaining or being put out. He is truly the best and most supportive husband of all time. He always tells me how proud he is of me working so diligently on the blog, instead of seeing it as something that takes time away from us. I am not kidding when I say I hit the husband jackpot!! As a way to give back a little, I decided to turn this week’s Creative Collective prompt into a get projects done around the house prompt. That way it’s blogging and an “us” project all in one…multi-tasking at it’s best! P is an award winning homebrewer (see project #2) and we brew beer on a regular basis. 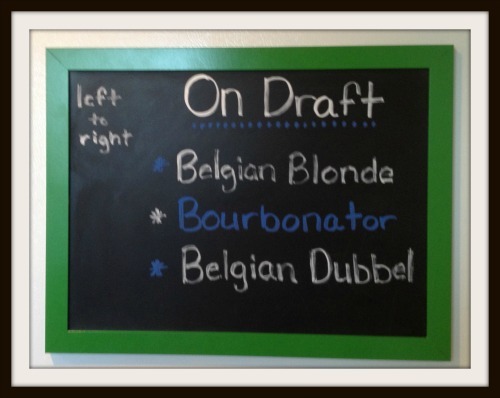 We have a dedicated fridge to hold the kegs, and I wanted a blackboard that shows what we have on draft in there. This is actually my second attempt at this project- the first one was not as pretty. Spray paint the frame “glass” (the IKEA insert is plastic and I’m not entirely sure if this would work on glass or not). Follow the directions on the can about how to apply the paint. After the paint has set (I would wait at least 24 hours), rub board down with the regular chalk, and wipe clean. This is a very important step to be able to erase the board like a traditional chalkboard. On the backing of the frame, place dot of glue in one corner and place magnet, holding for a couple of seconds. Repeat this step for the other three remaining corners and place two more magnets in the middle. 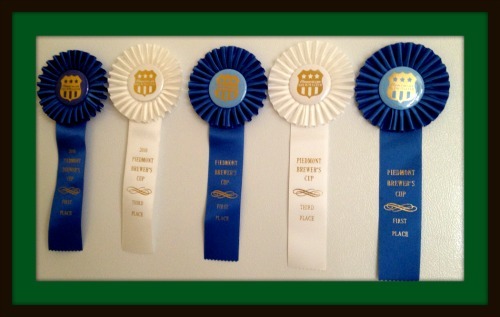 These are all the ribbons P has won from homebrew competitions. We actually have not entered one in a while but hopefully we will add to this collection. I wanted some way to display these and get them off the desk and this seemed to make a lot of sense. Place drop of glue on the back and place magnet on top of glue, hold for a second until set. Done. This project was actually on my 101 in 1001 list. P and I live a really great life; I think it is important to keep the big and small memories. I loved this idea as soon as I saw it. 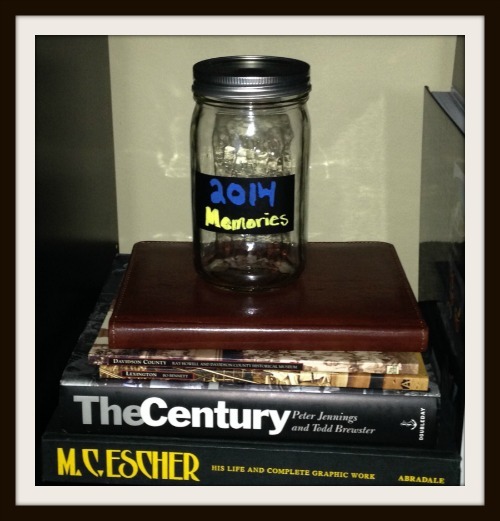 While this is not the most ideal jar, I wanted to start the tradition and was tired of putting it off. It could be prettier but it is serving its purpose. I think this one is pretty self-explanatory. Check back at The Nectar Collective Wednesday to see what all the other uber creativity bloggers did with the prompt “Anything Goes Art”.